2018 Volkswagen Touareg – price, specs and release date | What Car? T-roc, Tiguan, Touareg. Volkswagen's SUV line-up is now complete, but it's the Touareg which stands out in that crowd like a nun in a nightclub. The current car has been on sale since 2010, and if VW wants to compete against luxury SUV options such as theLand Rover Discovery, Audi Q7 and Volvo XC90 then it needs a significant rebirth. This new Touareg is wider and longer than the car it replaces, yet it's also more than 100kg lighter. It sports a large front grille with wide air intakes, thin LED lights and can sit on alloy wheels ranging from 18-21in. Underneath, it shares many components with the latest Porsche Cayenne. There's also more space in the Touareg's boot than before, it now has 810 litres. 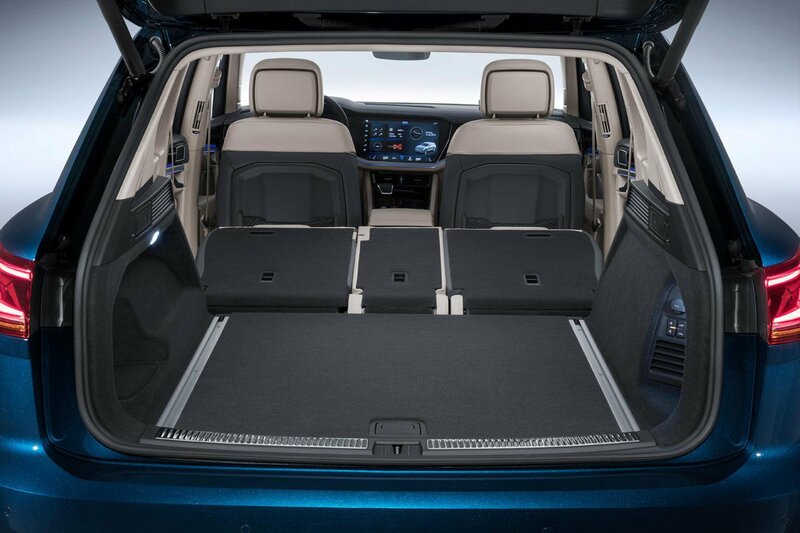 Boot space was something the old Touareg rarely fell short on, but you should comfortably fit everything you need into the new model, likely with room to spare. Volkswagen is offering a new infotainment interface inside the Touareg, dubbed the 'innovision cockpit'. The now-familiar 12in digital instrument cluster can be joined with a 15in infotainment screen to become one long panel that's partly angled towards the driver. This design means there are very few buttons elsewhere in the car, and the system includes Apple CarPlay and Android Auto smartphone connectivity, four USB ports and a WiFi hotspot. There's also an optional head-up display which projects the most important information into the driver's field of vision. The Touareg has five seats, despite rivals including the Q7, Discovery and XC90 all offering space for seven. There will only be one engine initially, a 3.0-litre V6 diesel with 282bhp. Shortly after launch, the engine range will be expanded to include another 3.0-litre V6 diesel with 228bhp, a 335bhp 3.0-litre V6 petrol and a 416bhp 4.0-litre V8 diesel. 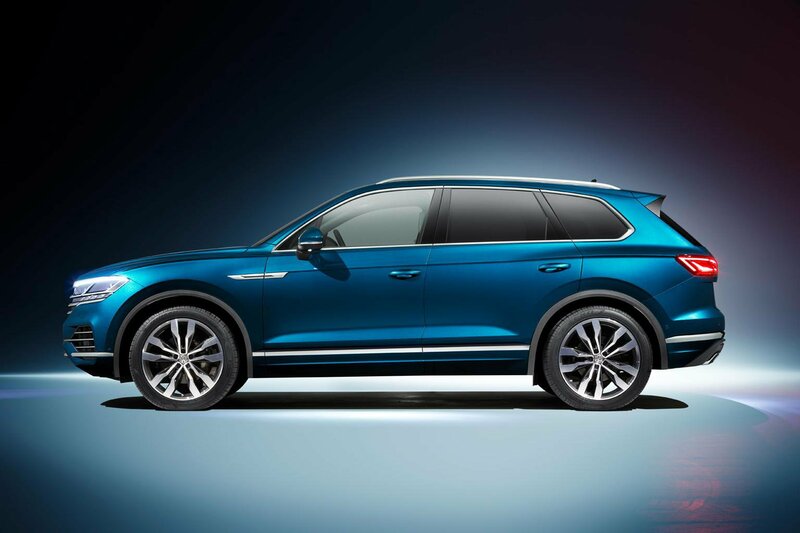 Volkswagen will also add a plug-in hybrid variant of the Touareg to its line-up, though no launch date has been given. 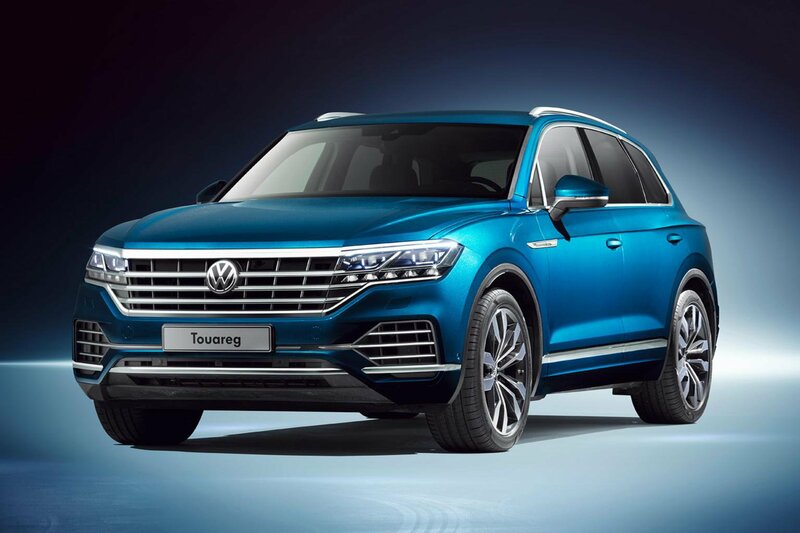 The plug-in Touareg will initially go on sale in China only, and will produce 362bhp from its petrol engine and electric motor. No matter which version of the Touareg you choose, you'll get four-wheel drive and an eight-speed automatic gearbox as standard. Drivers can choose between five standard and four optional driving modes via switches on the centre console. For those looking to tow with the new Touareg, the car can tow loads of up to 3.5 tonnes. All-wheel steering – where all four wheels are angled to give the Touareg a shorter turning circle – is also on the options list. 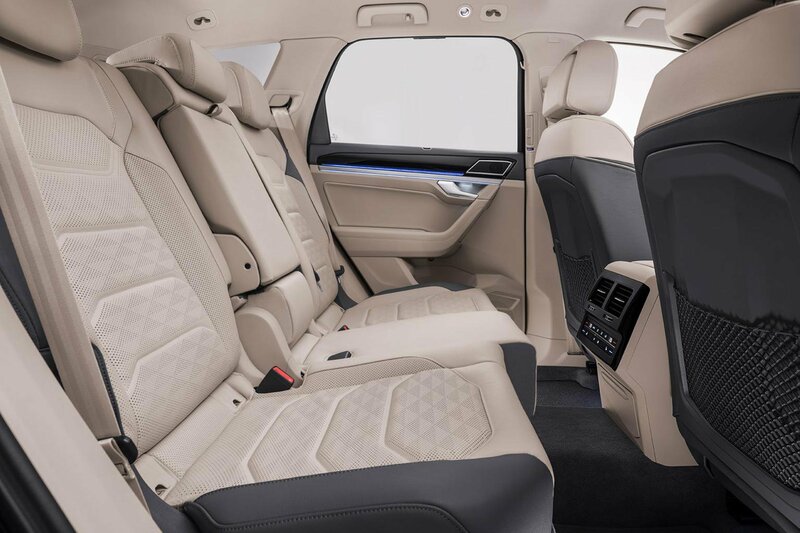 Drivers can choose from three trim lines – Atmosphere, Elegance and R-Line – which add equipment as well as different treatments for the interior. Atmosphere cars, for example, get leather and wood materials inside, while Elegance cars feature glossy plastics. R-Line models, meanwhile, get sporty interior and exterior styling. 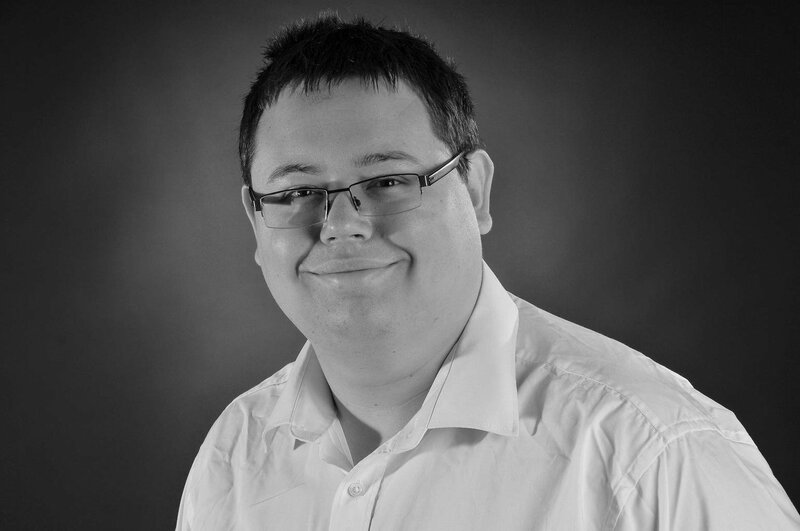 Standard equipment on UK cars is likely to include LED lights, cloth seats, a 9.2in infotainment screen, panoramic sunroof, dual-zone climate control and automatic wipers, plus automatic emergency braking with pedestrian detection. The most popular trim level among UK buyers is expected to be R-Line. 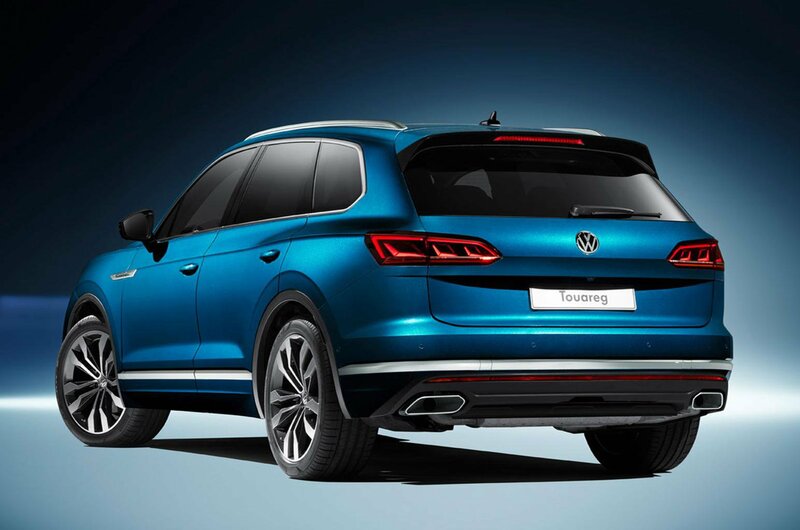 The Touareg's options list now includes massaging front seats, and new 'matrix' LED lights which work in combination with a thermal camera to highlight potential hazards at night. The new car has some semi-autonomous features, and can be had with VW's 'Traffic Jam Assist' system which allows the car to accelerate, brake and steer itself at speeds of up to 37mph. There's also an autonomous parking function, plus post-collision braking and lane-keeping assistance. 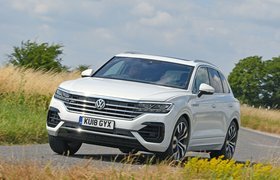 Volkswagen won't revealed the Touareg's starting price until closer to its launch, but with an estimated price of around £50,000, it will be only slightly cheaper than the rival Audi Q7 and more expensive than an XC90. Is the new Touareg out of your budget? Never fear, because in our next story we've rounded up the best used large SUVs you can buy right now.